This vintage style Captain America shield decal was designed with comic fans in mind! 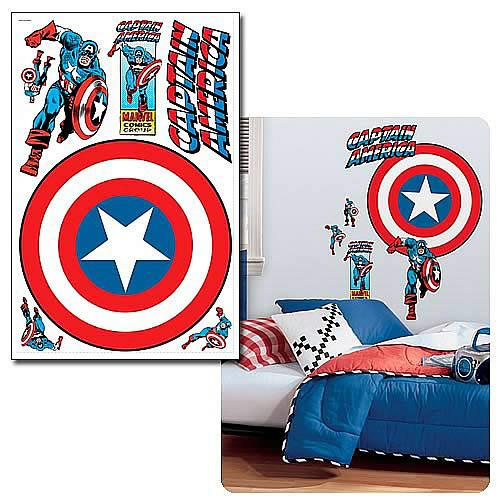 Measuring 25 1/2-inches wide, this huge wall sticker is a great way to bring your favorite comic book super hero into any bedroom, recreation room, or "mancave." Application is easy: just peel the pre-cut decal from the liner and smooth it out on the wall (or any other flat surface). You can remove and reposition it as often as you please without ever damaging the surface or leaving behind any sticky residue. It is even washable! Includes a total of 7 wall decals. Order yours today!